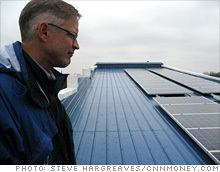 Chris Rohaly next to the newly installed solar panels on his office roof. The 2017 Indiana legislative session is underway, and this session includes three different bills dealing with distributed energy generation (most typically in the form of rooftop solar). These bills offer Indiana very different choices for our energy future. Most publicized so far is Senate Bill 309, which would end net metering (the interconnection policy that allows bi-directional connection to the grid). Net-metered energy flows in either direction through the meter. When you produce more than you are using, that energy flows out through the meter and builds a “credit.” When your demand increases, energy is drawn back through the meter and draws down your credit. Rather than engage in serious investigation and debate, this bill outlaws net metering, replacing it with a requirement to sell all energy from your system to the utility at wholesale rate and purchase it back at retail rate. It would be illegal for you to use any of the energy generated by the system you invested in. In addition, the door is left open for monthly fixed fees to be added to the bills of system owners. Illinois and Ohio have both reconsidered their net metering policies in the recent months. Both states have chosen to not only maintain but expand their programs to encourage development of a distributed energy industry in their states. SB 309 would have a poisonous effect on the solar industry in Indiana, killing many current and future jobs that cannot be shipped abroad. It stands in contrast to the other two bills under consideration. SB 500 defines limits on the power of a homeowners’ association to forbid the installation of rooftop solar. This bill is modeled after a Texas law and removes restrictions on personal choice. HB 1624 would allow school systems to purchase renewable energy systems through a third-party ownership financing. This would allow schools to benefit from the federal renewable energy tax credit, not possible today. This financing structure has been used in neighboring states to help school systems significantly lower operating costs as budgets shrink. Our neighboring states have chosen to strengthen their growing solar industries. Indiana has a great opportunity to do likewise. Or we can choose the exact opposite with just one vote. I encourage our Legislature to keep strong renewable energy growth as a priority, reject SB 309, and support SB 500 and HB 1624.